Redmond-based i-mate says it hopes to change the you work and think, particularly when it comes to PCs and smartphones -- by putting them together. The recovering company is currently working a product it calls "Intelegent", a Windows 8 Pro-based smartphone built from unusually high-end hardware. I-mate's $750 smartphone will feature an Intel Atom SoC, 2GB RAM, 64GB of onboard storage and a sizeable 4.7-inch display. If the mock-ups are to be believed, Intelegent packs all of that into a very svelte package. The firm also claims its phone will provide "10 hours of talk time", but 10 hours is a bold claim for a slim handheld -- particularly one that claims it could be 2-3 times faster than most current-gen phones and tablets. I'd suggest taking a "wait and see" approach here. 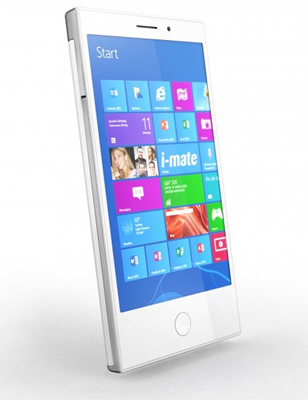 Little else is known about i-mate's Windows 8 Pro handset, although the firm's mockups show the device docked with a special desk phone. While docked, the smartphone can be connected to an external display and used as a stand-alone desktop PC. According to report, the Intelegent can also "power" a sleek-looking tablet; however, there are no details on this aspect of the device. These items can be purchased together as a $1,600 business bundle or the phone can be bought by itself for less than half that. The nascent handheld began its development about two years ago as part of i-mate's vision to reclaim the "full-desktop" experience for smartphones. The idea of a desktop-like experience on smartphones has has seemingly disappeared following the massive success of Apple's walled-garden apps approach. Perhaps though, upcoming launches like the Ubuntu smartphone and the Intelegent will help revitalize public interest in desktop functionality on their smartphones. I-mate says Intelegent will be aimed squarely at businesses users. However, if the product lives up to what's been described, I can imagine Intelegent's Venn diagram of consumer vs. business interest overlapping a substantial amount. How would you feel about Windows 8 Pro on your smartphone?